My father was 67 years old when he reported to the UCLA Medical Center for a CT scan to investigate a nagging complaint. As a physician, I always pause before ordering CT scans. Sometimes a scan shows more than I want to see. Sometimes it shows things I can’t recognize, don’t know how to fix, or worse – something I can recognize, actually know how to treat, but do not want to treat. Sometimes the treatment is worse than the disease. But this was in the back of my mind when my father asked me to check his report. So I took a look. And what I read scared me to death: “Heterogeneity in the head of the pancreas. Rule out pancreatic mass.”My heart sank. I remember staring at that line, just knowing what it meant. Pancreatic cancer is terrible. Almost nothing is worse. I’ve seen too many people die of pancreatic cancer. My mind sped through the inevitable illness, imagining the natural history of his impending disease and the suffering it would deliver in time. I contemplated the news. However, I noticed something about the report that gave me hope. Not all scans are created equal; the CT machine has all sorts of parameters and settings, and radiologists set the dials based on the situation. For my father’s scan, the machine was optimized to look at other parts of the abdomen, not the pancreas. The pancreas is deep within the belly, hiding away in a shroud of tissue. To really look at the pancreas, the CT needs to target the organ precisely and technicians need to inject a special liquid into the veins to light up the pancreas from within. So we repeated the scan the very next day, this time with the proper “pancreatic protocol.” The result was different: now there was a cyst on his pancreas. Not a tumor, cancer, or mass, but a fluid-filled cyst. Much better. I was relieved. But pancreatic cysts are also worrisome because some become cancerous. When they turn into cancer the prognosis is grave. His cyst was still a threat – a potentially serious threat. In fact, the cyst might have already become malignant, poised to spread throughout his body. What to do? Ignore the finding and we might miss a cancer. That would be devastating. Act on the finding and we might intervene on a benign cyst. The treatment for a tiny pancreatic cyst is draconian: remove the pancreas. The operation, called a Whipple procedure, is among the most difficult and risky in all of surgery. Can you imagine enduring a major operation, risking death, losing your pancreas, and then discovering the cyst was benign all along? But if the surgery found a malignant cyst, then it would all be worth it. For most of modern medical history, the doctor made all the decisions. The patient would receive the verdict, “You need an operation,” without a discussion of options. After all, the doctor had experience – often ten thousand hours or more of practice – and had seen it all. A doctor can apply her vast experience to interpret clinical data and offer sage advice to navigate patients through the toughest terrain. That’s the first circle of the Venn diagram. But over time it became increasingly clear that doctors don’t know everything. The doctor’s experience was necessary, but not sufficient, to make the right call. Research showed a striking disconnect between doctor and patient perceptions. In response, doctors and nurses began to formally document how patients felt, what they understood, and what they truly wanted. I call this “Thick Data”; it’s a term borrowed from social ethnographers that describes the rich, granular, human experience of being a patient, as reported by the patient. That’s the second circle of the Venn diagram. It was rare to find these emoticons in a hospital or clinic before 1999 when it became a national standard to document pain as a vital sign. Then, in 2004, the National Institutes of Health created a sweeping program, called PROMIS®, to measure patient symptoms, beliefs, and preferences across the entire breadth of the human illness experience. Now there are hundreds of questionnaires to track everything from fatigue, to depression, to joint pains. The 2010 Affordable Care Act, or Obamacare, strengthened the role of Thick Data by legislating that health systems measure aspects of the patient experience. As a result, hospitals and clinics are now wading in huge amounts of patient-reported data; doctors are just beginning to learn how to use it. That brings us to today. Up until this point, patients and doctors have made decisions by conjoining Thick Data with sage advice. The doctor takes a history, performs a physical exam, runs basic lab tests, orders X-rays or CT scans, finds out what the patients wants, and tailors an appropriate treatment plan that (hopefully) aligns with patient preferences and values. But things have changed again. The patient-doctor relationship has been fundamentally altered by the emergence of health information technology, or HIT. The idea behind HIT is that we can use computers, smartphones, social media, electronic health records, wireless broadband networks, and wearable sensors like Fitbit and Apple Watch to guide health decisions in ways never before possible. Obamacare has poured $30 billion into HIT, and the result is an explosion in computing technology and predictive analytics – stuff previously reserved for the business world, but now ubiquitous in healthcare. While the patient offers Thick Data, the digital exhaust of HIT yields “Big Data” – numerical rivers flowing off the massive HIT infrastructure, filtering through mathematical algorithms, and then calculating the predicted fate of individual patients. That’s the third circle of the Venn diagram. Here’s the problem: just when doctors and patients were learning to combine Thick Data with sage advice, Big Data came charging in like a bull in a china shop. HIT has changed everything, and the medical community is scrambling to figure out what it means for the patient-doctor relationship and for preserving the humanity of healthcare. It’s an exciting mess. 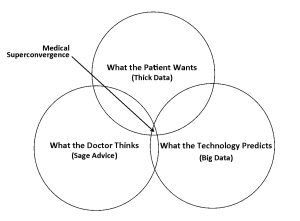 Those of us working with HIT in the clinical trenches recognize that Big Data, unto itself, means nothing for the patient-doctor relationship. Big Data is a vacant term – it just means there are 0s and 1s arranged in giant spreadsheets. But when conjoined with sage advice and Thick Data, Big Data can supercharge our medical decisions in ways never before possible. We must use this new superpower with care. Consider how this worked for my father. We had several options. First, we could remove his pancreas. But that didn't sound right since the cyst appeared benign. Second, we could do nothing – nothing at all. Just move on. But the doctors were not comfortable walking away. The third option was most acceptable to the doctors: check his pancreas every so often and monitor for a change. That was the sage advice. What did my father want? Did he want to live as long as possible, no matter what? Did he want to see his grandchildren married at all costs? Or, did he want to live as well as possible, no matter what? Did he value quality of life over quantity of life; that is, did he want to live as long as possible, but also as well as possible. These are sometimes different goals. An operation might save his life, but it might also leave him with lifelong pain. We asked him, and then documented his preferences in the medical chart. We also considered his current level of pain, fatigue, and anxiety. We needed the Thick Data – the human data – to make the right call. Then we turned to the Big Data to see what it predicted for my father. We fed his information into a computer that we programmed to foresee the future. We tasked the computer with considering my father’s unique predicament. To calculate the best answer, we inputted his age, the size of his pancreatic cyst, his risk of dying from an operation should he go through with it, and, most importantly,his values, symptoms, and preferences – the Thick Data. We plugged it all in: He was sixty-seven years old, had a 1.5-centimeter cyst, and was otherwise healthy with no more than a four percent risk of dying from surgery. And what did he value? He was clear about that: live well, above all else. He prioritized quality of life before quantity of life. He also had no significant pain, fatigue, or anxiety, further reducing the need for an urgent intervention. Then we hit the “run” button and sat back. Although it took us a year of research to build the original computer program, it took the computer all of four seconds to crunch over 100,000 data points to predict my father’s future. No human could ever pull off these mental calculations – nobody. The computer delivered a result: Do Nothing. Throw in the towel. Call it a day. It wasn’t a borderline call. It was definitive. Did we follow the computer’s supercharged advice? Heck no! Are you kidding? Follow a mindless computer’s advice for making a potentially life altering decision? The doctors’ sage advice was different from the computer’s recommendation, although both agreed surgery was sub-optimal. So we worked with my father’s physicians, negotiated a plan we all felt good about, and decided to repeat an MRI scan in six months. And when the time came, the MRI showed no change. We repeated the scan a bit later – same thing. Then we waited another five years, repeated the scan, and… the cyst was almost gone. <br.< br="">Six years after creating the computer program, publishing the results, and disseminating our findings to the medical community, we finally decided to follow its Big Data advice for my father – do nothing. In a seeming triumph of Big Data, mixed with a healthy dose of Thick Data and sage advice, we’ve continued to do nothing and, knock on wood, his pancreas remains fine – not to mention still in his body. This is the power of medical superconvergence. Employ validated patient-reported outcome (PRO) metrics, like those offered by the NIH Patient Reported Outcomes Measurement Information System (PROMIS®), to guide decision-making. Digital health scientists must prioritize research that evaluates how to integrate what the doctor knows, what the patient wants, and what the digital technologies predict. 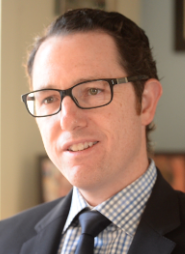 That way, patients and doctors can optimize HIT while maintaining the humanity of healthcare.